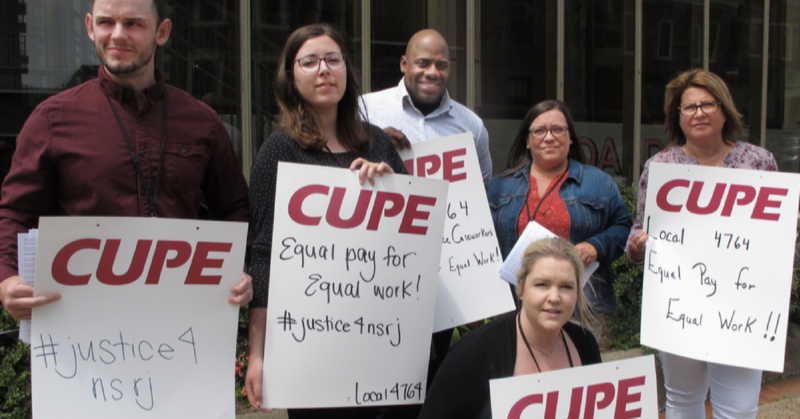 Bargaining for Community Justice Society caseworkers fell apart yesterday after the employer failed to deliver a wage proposal. The seven members of CUPE Local 4764 will be able to give 48-hour notice of their intent to strike 14 days after the conciliator files their report. The local passed a unanimous strike vote in May. The restorative justice caseworkers, who are paid about 56 percent of what probation officers earn for doing similar work and requiring similar qualifications, are looking for a wage increase of roughly 25-30 percent. Local 4764 President Denise Russell points out that “probation officers are overwhelmingly male while restorative justice caseworkers are predominantly female. This is an old story and it’s time that government rewrote it. A strike could leave restorative justice clients and communities without options, and interrupt court dates.